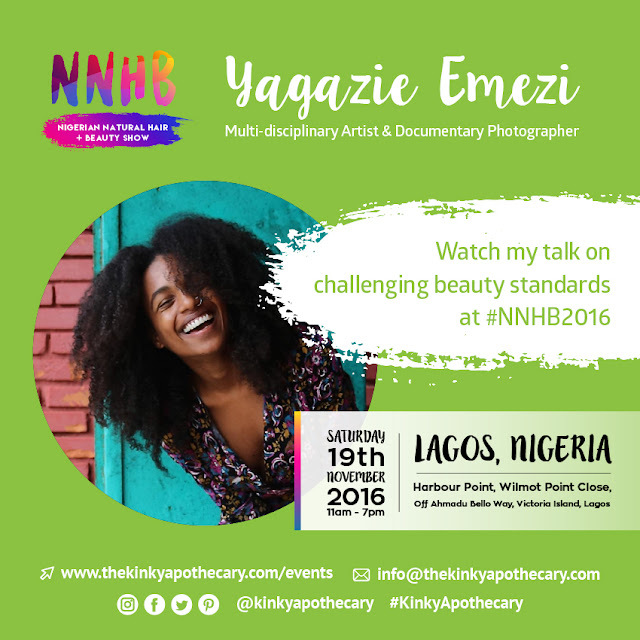 We've been such huge fans of Yagazie Emezi for years, especially her cartoons, and we're delighted to have her join us at The Nigerian Natural Hair + Beauty Show to talk about challenging beauty standards through photography! Yagazie is a multi-disciplinary artist and documentary photographer from Aba, Nigeria. She studied Cultural Anthropology and African Studies in the United States before returning to Nigeria as a Visual Curator for Bialere, a digital platform focused on showcasing young African creatives. She is a contributing photographer to Everyday Africa and a mentor on the Cointreau Creative Crew, a program set to promote the development of women's creative freedom and expression. Her works have been featured on Huffington Post, MTV, Format Magazine, Models.com, The Guardian (Nigeria) and Essence Magazine. She is currently covering education for at risk girls in Liberia alongside personal projects on scars and intimacy. The Everyday Projects at FotoIstanbul 2016.